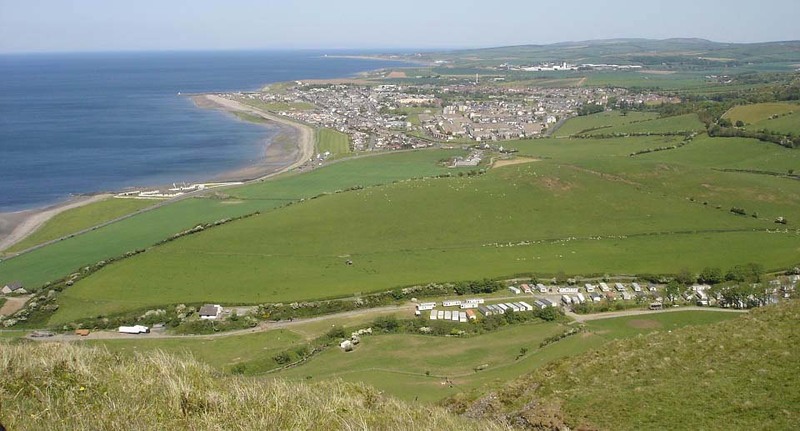 The hills on the south side of Girvan are a popular hike with a fairly easy route, or you can take some hard routes. The first hill on the ridge is Byne Hill at 703 feet, then Fell Hill at 755 feet, then Grey Hill at 974 feet. The walking route and range ends at Kennedy's Pass about 1 mile north of Lendalfoot, 5 miles south of Girvan. I drove from Ayr to Girvan following the main A77 road. At the south side of Girvan, at the large roundabout as seen below, I followed the A77 round to Girvan south beach car park, only a few hundred yards from the roundabout. The Girvan south beach car park is ideal for parking up for the hill walk. There is a snack bar, beach to cool the feet down after the hike, grass play area and toilets here. 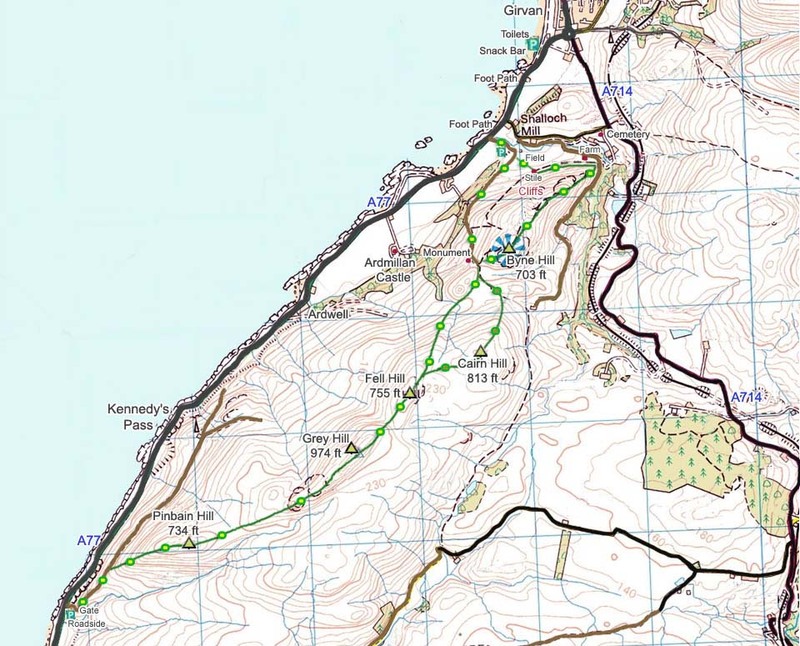 The Map below shows the walking routes with the green and yellow dots showing the good hiking trail, and green and brown dots showing the rough trails. The parking next to the hill road is on the farmers ground but there seems to be some people using the parking there to view the birds of prey on the Byne Hill cliffs. The Parking at the hill road to the south at Pinbain Hill is where there is a hill road gate, and hikers gate. This place only holds one car without blocking the road, so is only suitable for being dropped off or getting picked up. I parked by the snack bar and walked about half of a mile down the A77 on the roadside path to the first of two roads to Byne Hill as seen below. This building is named Shalloch Mill. This is one way to the north side of the hill but you have to go through a holiday park and working farm, so best to avoid this route. You cannot cut accross to the hills before the holiday park or farm from this road as the stone dyke along the bottom of the hill has an electric sheep fence on top of it. About 100 yards past the first road, along the A77 footpath, there is a hill road that leads all the way to a large Monument, Byne Hill, Fell Hill and Grey Hill. The farmer says this is the best route to follow as long as you do not have dogs, as there may be sheep, cattle and horses on the route. There are a few parking spots here on the left side of the hill road that people use for bird watching. If you are looking for a steep hike, follow the hill road round, then cross the field following the fence, as in the image below, to a stile over the stone dyke with an electric fence on top. You can then pick one of about five steep routes up between the rocks. These routes are so steep though, few people go up them. You can also cross the stone dyke here and follow the walking markers round to the north side, left in the image below, where there is a well worn, fairly steep, rocky path to the top. Images for that route can be seen at the bottom of the page, as this tour comes back that way. Below is a view looking back down the hill road towards Girvan. This is a steady climb to the monument at the bottom of the south side of Byne Hill. Following the road takes you right to the monument. The monument was erected in memory of Major Craufuird who served in India and took part in the capture of Cape of Good Hope in 1795. It is well worn with the weather as can be seen in the image below. The monument is right at the start of the hiking route up the rocky south side of Byne Hill. I decided to head south first to Fell and Grey hills then over Byne Hill on the road back. I decided to miss the 813 ft Cairn Hill, to the left in this image, as there were no trails over it, just moorland. You can see where the hill road turns to a quad bike track in this image below looking to Fell Hill. The first part of the track from here was dry, but looks like it could have been wet had it not been for this warm spell. If it is wet, probably best to make your way over the small hills here on the right and onto the track further on. From the top of Fell Hill, you get the first clear view of the highest hill on the range, Grey Hill at 974 feet. This looks higher than 974 ft, probably because it is right next to the sea. The image below shows the Troon to Ireland ferry passing the island of Ailsa Craig. Have seen this ferry passing Ailsa Craig on most of my hill waking in Ayrshire. This ferry once held the record for the fastest Atlantic Ocean crossing. The view below is of the trail leading to Grey Hill summit. The view below shows the range as it leads down to the 734 ft Pinbain Hill and road just south of Kennedy's Pass, about 1 mile north of Landalfoot. There is a place to park where the trail meets the A77 road so you could get dropped off or picked up there. That car park is not suitable for leaving your car. Image of the south side parking and gate. You can also see Landalfoot Hill in the distance that is a good scenic climb, right next to the sea. The view below is from the top of Grey Hill looking west towards Ailsa Craig. The wind must have been about 40 mph up here. Girvan beach had no wind at all when I left, and when I got back. Heading back to Girvan and the rocky Byne Hill. Going up the south side of Byne Hill, following the path, gives great views down over the Monument, Ardmillan Castle Holiday Park, and Ailsa Craig. Heading up the rocky south side of Byne Hill. Below is the Byne Hill summit with a brass plate on top giving directions to the main attractions all around. The view below shows the lower north part of Byne Hill. The lower part is where you get great views down over Girvan. The lower part has a few cliffs, so best keep any children well away from them. There is a good path to follow safely. 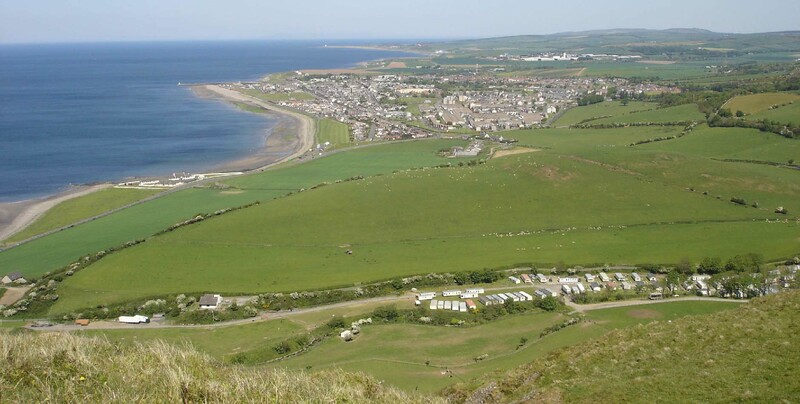 The view below is down over Girvan from the lower part of Byne Hill. There are a few good testing routes up to here between the cliffs. Large Image . Large Image looking up to here. The view below is going down the north side, a great way up or down. Note the farm and holiday park down there. The view below shows the north side of Byne Hill. They have a race up here in the first week of June each year for people that are a bit on the crazy side. The Girvan Lowland Gathering Byne Hill Race. The view below shows the exit/entrance to the north side of Byne Hill. The road here leads through a working farm and holiday park. To avoid the farm and holiday park, follow the stone dyke, a few hundred yards, on the hill side, round to the the Stile that crosses over this dyke, then cross a field to the hill road where the hike began. The view below shows the stile leading back to the hill road from where the hike began. I took this image from another hike to Byne Hill, when going over the stile and straight up one of the steepest sections between the cliffs. I parked my car at the side of the hill road, just off the A77 for that hike, as I was just going up Byne Hill and back. The walk following the hill road out to Grey Hill was fairly easy and safe for children. Byne Hill was the most interesting hill with great views down over Girvan. Just had to watch out for the cliffs on Byne Hills northwest side. The second hike I done was just to Byne Hill, so went straight up the steepest route I could see. There are about five tough routes up, so could be back to try the others.